Few music festivals are as rich, profound, and joyous as the New Orleans Jazz & Heritage Festival, now entering its 50th year. With 50 tracks recorded live, Jazz Fest captures the festival’s ecstatic spontaneity, which defines the essence and vitality of American popular music. Ever since its inception a half century ago, Jazz Fest has exuberantly expressed the unique confluence in New Orleans of Native American, African, Caribbean, European, Hispanic, and Asian communities. With essays and annotations by Keith Spera, Karen Celestan, Robert Cataliotti, Jeff Place, Rachel Lyons, and Jon Pareles, plus photos spanning the festival’s history, this box set delivers the sights and sounds of being at Jazz Fest for those who have not yet been there, and rekindles memories for the hundreds of thousands who return to New Orleans year after year. Come with 5 discs, over 300 minutes of music, and accompanying 136-page book. Out on May 10th. 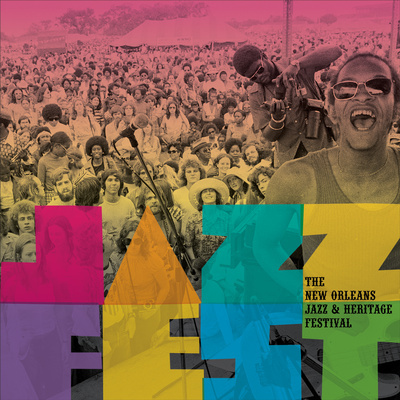 This sampler features 12 of the box's greatest tracks, with historic Jazz Fest performances from Professor Longhair, Trombone Shorty, Terence Blanchard, Preservation Hall Jazz Band, and more. Track annotations included! Preview the set with Rolling Stone and Off Beat. For further information, please contact Seth Langer at *******@**. ***.